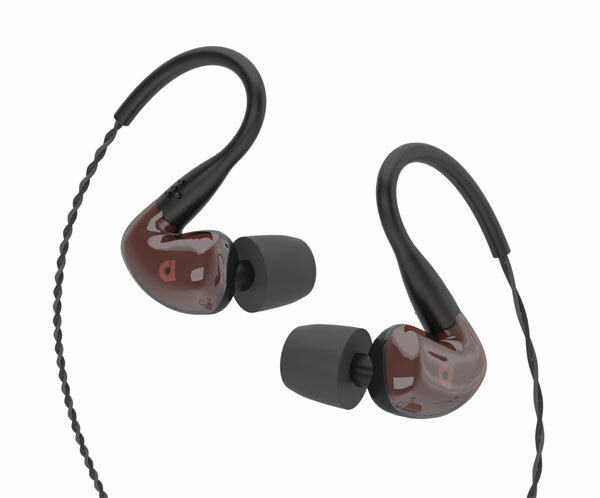 If you’re looking for superior sound from your in-ear ‘phones, then Audiofly’s near top-of-range AF160s are hard to beat for dynamics and impact, reckons Ashley Kramer. ONE AREA OF the audio market that’s absolutely booming is head-fi. The headphone and earphone segments seem be to a consumer wonderland of brand new and well-established brands all clamouring for dollars, which translates into more options than anyone can shake a stick at. Whatever your ear-focused aural poison, rest assured that someone is just aching to send it your way. That’s a good thing of course, because brands have to try harder to stand out from the horde. One of the newer brands is Audiofly, an Australian based company. They’ve been around since 2011, so they’re relatively new to the world of ‘phones. The $549 AF160 in-ear monitors on review here are the second from the top of the range in Audiofly’s Performance series. At that price, they’re certainly in the premium category, but as we’ll see, they have few hassles at all competing at this level. The AF160’s are a balanced armature design using three drivers per side. Frequency range is listed as being 18-22kHz, with sensitivity rated at 110dB at 1 kHz. They’re available in any colour you like, as long as you only like “Resin Red”, which does admittedly look pretty damn good. 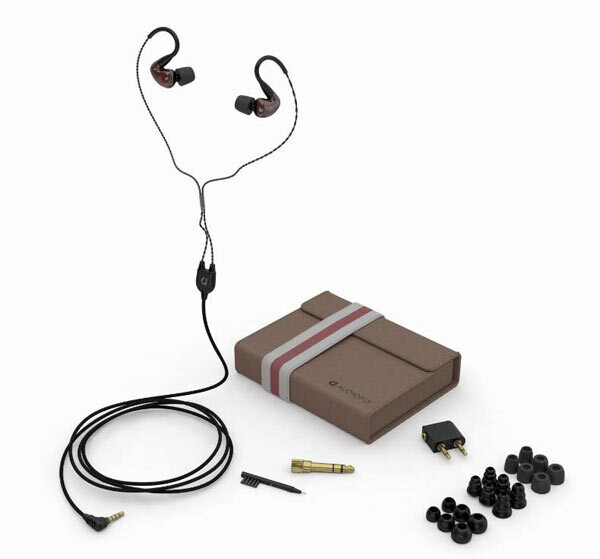 The supplied accessories include a 6.35mm adapter and an airline adapter (bravo Audiofly – this is a must have – why own a set of ‘phones like this if you don’t use them in-flight?) The little cleaning tool is another necessity, and it’s a good one, complete with a small brush, which will be very handy. Three types of ear-tips in three different sizes are included – standard soft silicon tips, tri-flange silicon tips, and Comply premium tips are included, so it’s easy to find the best type for your ears and preferences. Only one cable is supplied, a replaceable, over-ear 1.6m version without a built-in mic and remote, which seems like an odd omission at the price, although a mic/remote cable is available as an option. The cable is described as being “built for the stage: It’s super light twisted cable near your head, with tough Cordura fabric reinforcing the remainder”. The fabric section is really nice – it feels rugged, looks good and is hard to tangle, but unfortunately the lightweight braided section, like most of its ilk, ties itself in knots at the drop of a hat. I’m not totally convinced of the durability of these brained cables but they seem to deal with day-to-day demands of earphone use well enough. A leather carry case is supplied. It’s quite stylish and very much in keeping with the rather Hipsteresque look and feel of the product packaging (which is itself in keeping with the premium orientation and price). But it’s huge! Certainly the biggest case I’ve seen with a set of consumer in-ear monitors – that’s a pain for me given I’m always on the road, so space is at a premium but it might well be a non-issue for you. The bulbous body might look a touch ungainly and blob-like but with the soft Comply foam tips, the AF160’s are amongst the most comfortable in-ear ‘phones I’ve ever had the pleasure of wearing. The angle and placement of the ear tips has been finely judged, and the smooth finish means that there are no annoying hot spots – you really can wear these things for hours – so long-haul flights or big commutes should be a non-event. The noise isolation is also excellent, at least with the foam tips, which in my experience always offer the best overall balance between keeping the noise out and being comfortable. In short, what’s not to like? As expected at the price point, of course the AF160’s sound good. But then again, if you dropped this much money and they didn’t, you’d be more than a little miffed. What they do however is take “good” and run with it – in fact, they sound great. My favourite in-ear ‘phones of all time are my trusty Ultimate Ears Super-Fi 5 Pro’s (eight years, three cables, too many flights to mention and still going strong as seen here). They’re not the most revealing ‘phones I own but they tread the fine line between letting me hear more than enough detail without being too forensic to deal with for long periods over all kinds of music. They’re also quite warm and have a big bottom end that’s not overblown or out of control. Most importantly, they hit hard, making drum strikes and bass guitar notes feel powerful and realistic. The AF160’s remind me of them in some ways, albeit without the big bass. They’re also quite warm, but not too much so. And they’re revealing, especially once they’ve had a good few hours of hard running, but again, they’re not over the top in this regard. You can dig down into the musical detail in the same way you can with any premium ‘phones but you won’t be tempted to turn them down unless the recording you’re listening to is seriously bright or badly recorded. The bass from the AF160’s is interesting: the initial impression is that it’s a bit light and by no means deep enough, but that’s only by the standards of a world where the new normal is bass-boost on max! Spend some quality time with your favourite bass tracks and it won’t take long to notice that there’s more than enough bass on offer, it just hasn’t been boosted to the heavens and beyond. The AF160’s deliver enough low-down goodness to make tracks such as ‘Young Men Dead’ or ‘Manipulation’ on the amazing Passover album by The Black Angels sound deep and imposing, exactly as they’re meant to. The AF160’s are just as happy with tracks like ‘Daddy Fat Sax’ from Big Boi’s Sir Lucious Left Foot: The Son of Chico Dusty or ‘Stand Inside Your Love’ from Smashing Pumpkin’s Rotten Apples. Unless you’ve transitioned straight from bass monster headphones like Sony’s MDR-XB920’s (review here) or Skullcandy’s somewhat mental Crusher’s (review here), you should be totally fine with the bass on offer here. This is especially true when you take into account the AF160’s strongest suit – the fact that they hit even harder than my Super-Fi 5 Pro’s in terms of delivering sheer impact. I’m not talking about low bass here, more the ability to make music sound and feel dramatic. The sound of a drum vigorously hitting a skin shouldn’t be a minor event, it should make you sit up and take notice. The same goes for a bass guitar. The AF160’s are so good in this regard that they’re almost addictive. Switching back to my Logitech UE-900s in-ear monitors (review here) showed this in no uncertain terms. The Logitech’s definitely go a bit lower and they’re much more revealing but they sound a touch flat in terms of sheer power and dynamics when compared to the AF160’s, so that’s quite a feather in the caps for Audiofly’s design team. The midrange and treble are very good indeed, contributing to that highly resolved yet smooth sound, and the AF160’s put on a wide and spacious soundstage, with artists and instruments sounding far less constrained and “in your head” than in many similar ‘phones. They’re easy to drive too, running noticeably louder for the same volume setting than my Ultimate Ears UE900s in-ear monitors. The only glitch I could find is the lack of a supplied mic/remote cable because that’s become the standard way to use earphones for many, myself included, but these ‘phones are good enough to make that something I could overlook. There are no real sonic weak spots to be found here – sure there are ‘phones that’ll do certain things better, maybe more bass, or more top end detail, but that’s almost always the case. What’s really appealing here is the balance of abilities, and the way they come together to make a smooth, seductive and non-fatiguing sound. At the end of the day, these ‘phones look, feel and sound like they’re worth $549. That’s a lot of money for most people, but these things won’t give anyone buyer’s remorse.